Soilwork are back and have never sounded better. July 2 sees the release of their seventh album, The Panic Broadcast, and it's a definitive statement from the forward-thinking Swedish metallers. It's also the first album since the welcome return of guitarist and founder member Peter Wichers and the debut of fellow axeman Sylvain Coudret. Here's part two of our exclusive chat with Peter, and here he goes into more detail about the album's songs and production process. But if you missed part 1 you can catch up here. You came in with a lot more experience as a producer for this album, did you find you work a lot quicker as a band now when recording as a result? "Yes I've been focusing on that entirely since I've been away. I consider myself to have a high work ethic and coming into it we had a very strict time frame in which we needed to get everything done. I really didn't take one day off in eight weeks. It was pretty intense but we needed to get it done and I would say that everybody was pretty well prepared and it helped a lot that we'd done preproduction." The band set up in a house to record this album, what effect did that have on the experience? "I did that as well when I produced the Nevermore record [The Obsidian Conspiracy]. It's right outside of Charlotte North Carolina and there's a big lake. There's massive houses there that you can rent and I did it for Nevermore and it worked out very well so I suggested to the guys that we did the same thing. And I think in a way it gives you a more relaxed atmosphere. Sven [Karlsson] set up his keyboard station in his room and then the whole basement was the recording base where I brought in my studio gear. We ran cables over to Isolation walls so we could record on the other wide of the house. It was just a very, very relaxed that helped people to perform better. Because I know a lot of times you can be in a studio and one person is sat outside watching TV or playing video games while one person is recording and everyone else is banging on the door trying to get in. This was a different way but I really think it worked very well." You've mentioned how well prepared that band were with the songs going into the album, but what about your lead guitar parts? "I had practiced my parts like crazy but I'm so used to doing things this way so I guess that's one reason I was so prepared. I think everyone was pretty decently prepared but since we live all over the place, we don't rehearse before recording. We do it all over the internet and everybody needs to know their parts for when we get together. The first time we usually rehearse is when we do pre-production for a tour." Did you contribute a bulk of the music to this album? "Yes, I wrote six songs completely then co-wrote two of them with Sylvain and he wrote two as well. It's all me and Sylvain pretty much." "Bjorn ['Speed' Strid, vocals] said to me a little while ago, Man I'm listening to the record and it's a lot to get through - there is a lot going on! There is but I feel like it's the record Soilwork needs to make now." There's obviously signature Soilwork moments on the album but Let This River Flow feels like a departure - a ballad but heavy with some interesting twists too, including the use of acoustics. Did it start as an idea on acoustic guitar? "It did actually. Bjorn wrote that acoustic part at the beginning and when I wrote that song I based everything on that guitar part. I tried to take the approach of Dimebag when he said, if you can play a riff three different ways then you have a song. And that's kind of how this song is. But you've got to really listen to it if you want to hear it - if you play the same riff over and over it can get really boring. "With regards to the middle section, we had a lot of major key on Natural Born Chaos which I think made it really unique. The song is pretty minor key until you get to that middle section and then we do something completely different. That's kind of progressive in a way but it felt natural. Then that whole part came at once then leading into the next part we needed a breakdown and Bjorn came up with some great vocals for it. I think that his performance on that song is probably one of his best on the record." Is this record the first time you've produced Bjorn's vocals? "It's not really but it's been a long time since we did stuff together and I was so proud of Bjorn. He really is one of the best vocalists I've ever recorded because he just gets it immediately - harmonies and everything. He's a one take wonder guy. If you try to come up with an idea for something, usually the first idea he comes up with is fantastic. "It's been a joy working with him again and we're thinking about doing some other stuff on the side which is little bit less screamy, because it's something that maybe wouldn't fit into Soilwork. But that's going to be further down the road." A lot of metal vocalists are now doing the whole clean/screaming dynamic but Bjorn was one of the pioneers in many respects. He seems to be bringing even more variety to the table on this album - was that a conscious decision? "That's kind of what I love about Bjorn because he's always trying to surpass himself on every record. I think that for him, there's so much emotion in what he does this time and I think it shows on the record. He sings differently to how he did before and it's not different in that it's not as aggressive, it's a different approach. To me it sounds like a re-vamped Soilwork - it sounds like us but it's different, different but good." The final track - Enter Dog Of Pavlov - is a standout and it's quite unusual for Soilwork in that it has a long intro section. How did that song come together? "That was one of the songs me and Sylvain co-wrote. That whole first part is based on the clean intro at the beginning and we did that together. I said to him, Hey man have you heard the new Alice In Chains single? We loved it so said lets do something like that. "A lot of times before Soilwork has strived to get that radio song to get something going. After seven records it's probably not going to happen and that's not a bad thing so we thought, let's do what we're good at. And if that's a six minute song or a three minute song it doesn't matter - as long as it feels like it's genuine. I really think that's what we were trying to go for on this record. That song is a standout song on the record and it's interesting because it's not the kind of song you'd expect." How do you feel that you've developed as a guitarist since the last time you played on a Soilwork album? "I feel that I've got a lot better when it comes to the composing aspect. I feel that I I've got better as a guitar player but it depends how you measure it. I consider myself to be a decent lead player but above that I think the rhythm aspect of my guitar playing is the best it's ever been." "You can probably tell which song that was! That riff on The Thrill was a bluesgrass riff that I had practised and thought it was kind of cool, so I did something as a joke and the guys said, this is awesome - we should do it as a metal version! So that's how that came about, it was really us trying to do what we thought was fun as opposed to just thinking about what will make the record all sound similar… we thought it was more fun to have a spontaneous record. "But to answer your question, I know Sven listens to a lot of Aphex Twin and Ulver, while Bjorn is a major classic rock fan. I listen to a lot of acoustic playing like Andy McKee, Sam Bush and Tony Rice - tons of different guitar players. Guthrie Govan too… I also appreciate good songwriting and it doesn't matter if the song is rock, pop or metal. If the song is good and the melody is good the chances are I will probably like it. It doesn't have to be metal or shred for me, it could be a case of, oh man that's a great chord progression. 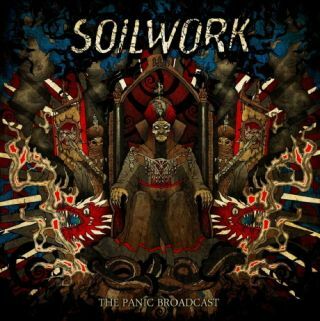 A lot of that we try to bring to Soilwork but we try to disguise it in a way that has more of a metal twist to it." So now the album's done your initial touring plans are in the US, will you be coming to Europe after? "Absolutely - we're trying to figure out the different game plans. We're talking about coming to Europe in October so we're figuring out timing. You need to see [what other metal bands are] touring at the same time and you don't want to clash with stuff like that." Have you rehearsed any of the new songs live yet? "No we haven't rehearsed once since [completing] the record. This US tour is in July so we're going to have pre-production for that and this time I think we're going to have lights and everything. This record needs every element of production to it, it's important." To hear Two Lives Worth Of Reckoning, a preview song from The Panic Broadcast visit Soilwork's MySpace.